When you sell or give one of your scroll saw pieces it's a nice touch to include a Handcrafted by Certificate. 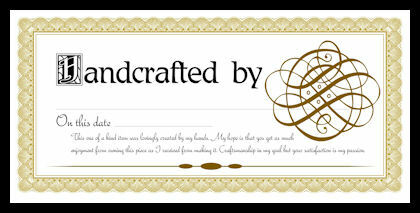 The certificate says "This one of a kind item was lovingly created by my hands. My hope is that you get as much enjoyment from owning this piece as I received from making it. Craftsmanship is my goal but you satisfaction in my passion." I had hoped to distribute this certificate in a high quality vector format but the file size was just too large. I converted it the the highest quality .jpg as possible for printing. It printed pretty well on my inkjet printer so hopefully you will find it useful.